Popped in here a couple of weeks ago after looking round the power station, pleasantly surprised, the pub was heaving as a big match was on, staff as friendly as you like despite being so busy, and the place was spotless. We managed to bag a table and spent an hour imbibing decent wine and good atmosphere, shame it's not in our usual neck of the woods as we would definitely visit again. And again. 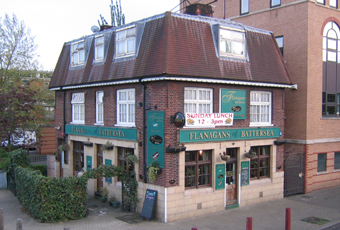 Found this place by accident on my way to Battersea park and what a complete and utter gem of a place, friendly staff,clean , fantastic and great value grub,Locals are that good mix which make a pub work, been back four times already,Super pub go there! Theres a new chef there now and the variety on offer was great .. everyone who i was with had something different and all commented on the quality. Portions were very generous too. It might have travelled through the gastronomic doldrums at one stage but has sailed out the other side with all flags flying !! We even stayed on for the friday disco too for a while and had a laugh guessing who did all the 60s and 70s tunes. real fun. Working hours permitting we`ll all get back there again in the not too distant future. Try it out.. we did with no regrets whatsoever.